EVENT Summary Report: 5 years after Fukushima, what are the lessons for Europe? 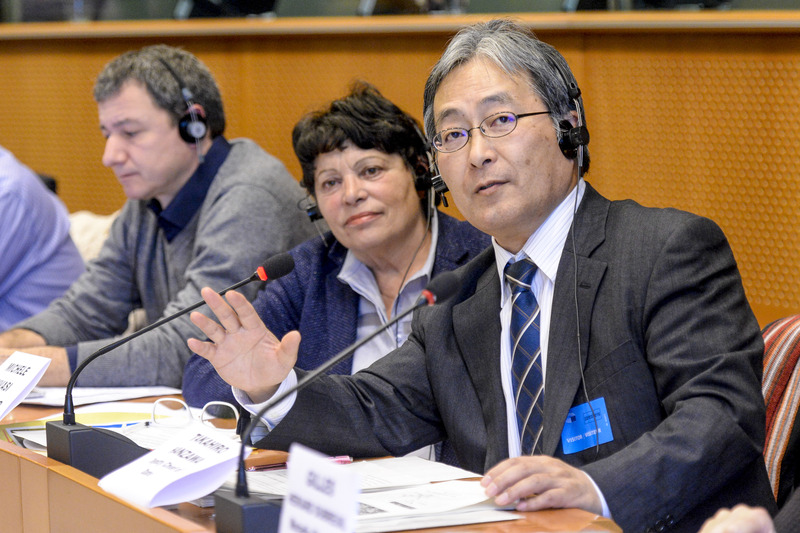 On 22nd March 2016, NTW organized a conference in the European Parliament: 5 years after Fukushima, what are the lessons for Europe? It was the opportunity to listen to witnesses from Japan and current challenges in Europe. In her opening statements, Michèle Rivasi, Chair of Nuclear Transparency Watch and Member of the Parliament (Group Greens/ALE) and co-founder of the CRIIRAD, reminded that she went to Fukushima twice where she could have direct contact with the population. She noticed two important facts at the time: first, the lack of information provided to the population about the potential consequences of the nuclear accident for exemple in terms of radioactivity, and secondly a general tendancy to minimize these consequences. The nuclear accident of Fukushima was the starting point to create Nuclear Transparency Watch in 2013 following the call of MEPS for more transparency on nuclear safety. Indeed, Fukushima showed that even a country with high technology like Japan absolutely needs to involve civil society in order to improve nuclear safety. This conference, thanks to the different speakers, aimed to show what lessons we can learn from this accident in order to improve safety standards in european nuclear power plants. Michèle Rivasi concluded her introduction by emphasizing that we should always consider the human catastrophy at least as much as the technical one. Mr Takahiro Hanzawa, representative of the municipality of Date made his presentation about the Responses of Date city to radiation disaster caused by Fukushima Daiichi Nuclear Power Station Accident. For a reminder, Date is located in Fukushima Prefecture, about 80km from the Fukushima Daiichi Nuclear Power Station (FDNPS). At the time of Fukushima nuclear accident, 1000 evacuees living in the 20km direct radius from FDNPS came to Date City, however, three months and a half after the accident, it was realized that the site was too contaminated to be safe for human beings and evacuated. During our event Mr Hanzawa mainly tried to show that the current situation in Date is under control. According to a study, among the 52, 783 citizens who monitored their external exposure doses using dosimeters fr 1 year), 95% were under the dose of 2mSV, when date’s practical target is 5 mSV/year. Mr Hanzawa stressed as well that radiation protection of children succeeded as apparently no children under 15 exceeded 4mSv per year. The reaction of municipalities and residents showed that at first, as there was no preparedness and scenarios for responses, people and municipalities had to act at their own discretion. Immediately after the accident, a flurry of mixed information were communicated to the public, which was partially caused by lot of contradictory information on social media and had a counter-productive effect. The information stabilized and the surrounding situation gradually became clear and correct information gradually spread. Mr Hanzawa explained that the level of radiation in Paris, Tokyo and Fukushima are pretty much the same, relying on a study made by foreign students coming from six highschools. However even if the level of radiation is now considered safe, it is a real problem because people are reluctant to return, for economical reasons and because they already started a new life somewhere else, which represents a real challenge for japanese authorities. He then reminded that 5 years after the Fukushima accident, there is no clear prospect of decommissioning at Fukushima Daiichi and that decontamination and infrastructure reconstruction have not progressed in « difficult-to-return » areas. Mr Hanzawa concluded his intervention by saying that sharing information quickly is important at a european level and that collaboration of countries is essential in nuclear accidents. Gilles Hériard Dubreuil, Director of the french consultant group Mutadis, presented a report on Local populations facing long term consequences of nuclear accidents. Gilles Heriard Dubreuil emphasised the fact that post-accidental management is a very peculiar case that needs a lot of attention in order to be able to understand its complexity, created by a set of interdependent elements. Indeed a nuclear accident is not only radiological but has an impact on all elements of the daily life for people living in contaminated areas, but also for the people leaving the area (and who are then trying to start a new life somewhere else with all the problem it can involve). All activities are impacted (economy, education, leisure, public services, etc.). Local populations are facing important dilemmas : should they stay or should they leave ? They need to make very difficult choices, and there are few dispositions for people that self evacuated. Added to these dimensions is a general feeling of loss of control. In that situation, populations wait for information, support, expertise but usually, because of some misunderstandings, misinformations or even some lies, there is a real of lack of trust developping towards the social system, which then leaves populations feeling even more lonely while facing the crisis. This type of situation raises the question of governance as the classical top-down approach is not suited to this type of situation. Public authorities can provoke adverse effects like spreading distrust and damaging social bonds in a very serious way. To conclude, Mr Dubreuil observed that post-accidental management can never be a return to normal, it will always be a transition state, but to understand all the complexity and the stakes of a situation helps and facilitates this transition. The main goal is for people to find a transition path towards regaining autonomy and dignity. This first panel was concluded by the intervention of the italian MEP Dario Tamburrano, Group EFDD, co-hosting the event and who actively engaged in passing an amendment so nuclear energy wouldn’t be financed by european institutions. In his speech, he evoked the Italien poet Garete who compares humans to autumn leaves staying on the trees before falling. This metaphor expressed his worries about the choice of nuclear still being very tempting for numerous member states, even after the two severe accidents of Chernobyl and Fukushima. In Ukraine, european institutions currently finance the improvement of nuclear facilities dating from before Chernobyl, which is an accident that Dario Tamburrano will always keep in mind as a terriying situation. Now, even in best scenarios, societies will always to face the difficulties of nuclear contamination and of radioactive waste. This temporality of thousand years is totally unknown for humans. Dario Tamburanno concluded by stressing that it’s always investors who are protected, and never the citizens’ health and safety. British MEP Julie Ward, Group S&D went to Fukushima in september-october 2014. At the time she saw bags of contaminated soils just left out and slowly desingrating. She was also told that children in that area couldn’t longer play outside and touch the soil, being therefore deprived of their ability to live a normal life. Reiko Hasegawa, researcher from Science-Po Paris who interviewed about hundred evacuees and the local government, stressed that the dosimeters doesn’t take into account the air dose rate of forests and mountains, which covers 70% of the territory around the catastrophe. If dosimeters showed lower rates for children, it’s precisely because they are not allowed to go to those areas. She also wondered how the rates of mountains and forests were included in the figures provided by Mr Hanzawa to show that Fukushima, Tokyo and Paris are at the same level of radiation. She stressed that if populations don’t want to come back it’s most likely because opinions differ even among scientists, and it’s not, as Mr Hanzawa suggested, the citizens who are responsible for spreading different informations. Michèle Rivasi reminded that the crisis management from the Japanese Government was far from satisfying and lacked anticipation and communication. She considered really important to be able to criticize its own country in order to gain trust and to find a collective solution. Mr Takahiro Hanzawa said how angry he felt against his country and recognized the deficiencies and flaws that happened at the time of the accident. On the situation of children however, he maintained there weren’t and isn’t currently such control as most children are just going to school as normal and getting in contact with nature. But Mr Hanzawa recognizes that there is a big problem of trust as people don’t plan on coming back, and to gain this trust back is a real challenge. About the contaminated soil, David Boilley added that the japanese government is expecting 20 billions cube meters after the reduction by incineration. This matter is already an issue in peaceful times but in case of an accident it becomes even more problematic because of the particularly huge amount that has to be dealt with in a moment of distress. German S&D MEP Jo Leinen opened the second panel by reminding that we are not really prepared for an accident in Europe. If member states do have national emergency plans, we need more efficient and harmonized European emergency plans. The Chair of the Association for the Control of Radioactivity in the West (ACRO) David Boilley, made a presentation based on two case-studies in France and Belgium.The first finding is that the extend of the preparation zones is too short in both countries. There are also significant differences between the two countries and direct information to the affected population also stops at the border. Regarding iodine prophylaxis, pre-distribution is too limited. The highest concern is related to evacuation that may become a life-disrupting protection measure and David Boilley stressed that vulnerable populations (particularly elderly and in hospitals) are at risk in case of emergency and they should be protected. There is an urgent necessity to have a scientific assessment of the evacuation plans. The comparison between Belgium and France shows that operational intervention levels are not harmonized, and usually not based on scientific and objective grounds. Present plans in Belgium and France, both highly nuclearised countries with dense populations, only take into account accidents up to a level 5 on the INES scale. Such a limitation is due to the fact that the current population in a 30 km radius around Fessenheim is more than one million, and 1,5 million for Doel, when the population in a 30 km radius around Fukushima was of 170 000 at the time of the accident. The lessons from the Fukushima disaster were not learnt and the evolution towards more realistic plans is too slow. The recent recommandations of the Belgian Superior Health Council represent however a real change. It is worth noticing that it recommends the implementation of the new framework as promptly as possible in 2016 (see article of NTW in our Spring Newsletter). On the other hand in France, the national plan of January 2014 and the new local emergency plans (PPI) show no change, and the IRSN even advocated to reduce the number of evacuated people. Finally, David Boilley raised the crucial issue of every stakeholder involvement, considering that some emergency plans are not public and therefore never debated. Nadja Zeleznik, from the Regional Environmental Center, chair of the NTW working group on EP&R presented a report on current european EP&R standards. The Nuclear Transparency Watch EP&R working group was formed with the goal to evaluate the existing the European and national EP&R provisions from a civil point of view, in order to identify key challenges and to inform the public. The EP&R report included many deficiencies pointed out by civil society, showing that current EP&R provisions remains out-dated, inadequate and that citizens and Civil society organisations (CSOs) are not involved in emergency and post-accident strategies. Taking that into account, NTW main recommandations are a strong CSOs and public engagement in planning and management at local, national and transboundary levels, a start toharmonise emergency provisions (emergency zoning on evacuation, sheltering, iodine distribution).There’s also a need for developing a legal framework involving civil society at each level of preparation and decision in the spirit of the Aarhus Convention.NTW wishes to see the European Commission playing a key role in this development, and there are 3 main areas for further action : The need for multi-stakeholder assessment of the existing situation, formal or effective and qualitative transposition, and further investigation with regard to civil society. Nadja Zeleznik concluded by stressing that the latest Basic Safety Standard (BBS directive, to be implemented by early 2018) is a good opportunity to improve the EP&R arrangements if not taken only formally and really implemented. NTW helped organising the Civil Society and NGOs to take part in these improvements. Philippe Jamet, Commissionner of the ASN reminded that Fukushima is really quickly forgotten. However, we have to prepare for such a severe accident, as it cannot be excluded in any country in the world. In other words, the question is not whether there will be an accident or not, the question is when. It is clear that there are lots of differences between countries and that if these differences remain, the early management of the emergency will be erratic and probably impossible. This status was the basis for the work produced by both HERCA and WENRA, which built a consensus in 2014 between the authorities responsible for safety and radioprotection. Where are we now on this matter? Philippe Jamet explained that they currently observe still quite a lot of resistances and arguments in reaction to this consensus, which can be considered as quite advanced. The first obstacles concern national approaches and the national sovereignty. Another obstacle is that there are many actors involved. Olga Kalisova, from the organization Calla (tcheque organization for protection of the environment), asked to Mr Jamet why HERCA and WENRA didn’t just try to tell the industry to stop and to organize the decommissioning. Michèle Rivasi stressed it would be really important to give more power to the European Commission as well as regulatory bodies. She then asked a question related to the Belgian case. Indeed, even though the belgian safety authority stated that Doel and Tihange reactors don’t correspond to standards, the decision was made to restart them. How would it be possible to strengthen the power of safety authorities so the final decision is not only influenced by economical and industrial factors? Albena Simeonova, representative of the bulgarian Foundation for Environment and Agriculture said that in Bulgaria funding for decommissiong and Radioactive Waste Management is only available for 13 years. How do European countries like France in Belgium fund the back-end of the nuclear cycle? First of all, Philippe Jamet reminded that regulatory authorities don’t have any responsibility on energy policies and have to follow national decision (phase-out or continue). But it is impossible to phase out quickly and even during the time of phasing out, countries would have to prepare anyway for an accident which implies a continuous and significant work.. In the case of Belgium, it is part of the sovereignty of the country to decide whether to continue operate the installation or not. He then reminded that a counterpart of civil society is paramount at a European level and welcomed the existence and work of NTW. On the question about waste and decommissioning, in France, the utility must put some money for decommissioning and waste, and they must regularly reevaluate the costs, which are controlled by the government with the support of the regulatory authority who is controlling the technical plans. In his closing remarks, Jo Leinen stressed again the likelihood of an accident in Europe, in contradiction with everything that is often heard on Chernobyl being a soviet accident, and Fukushima being an accident linked to Japanese specificities. He wondered if we are really prepared to take that risk, knowing that some governments chose to phase out after the Fukushima event. It is a political battle going on. Civil Society has to point out a lot of elements in risk management and risk avoidance. Michèle Rivasi had a final word to remind NTW next activities this year: a seminar on decommissioning, and a workshop about the potential terrorist attacks on nuclear power plants focused on drones’ threat, which sadly appeared that day to be more relevant than ever. (The terrorist attacks in Brussels happened just few moments before our event started in the European Parliament).